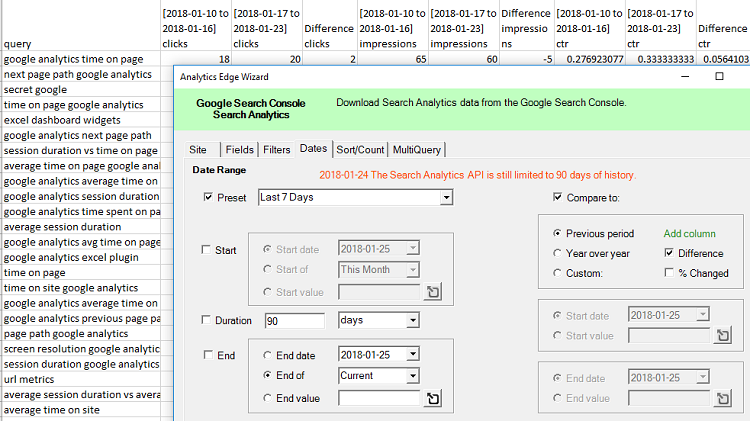 In preparation for the heavily expected 16 months of search history coming to the Google Search Console API (not quite here yet), the Analytics Edge connector for Google Search has been updated with a new Date Compare feature! Now you can easily compare the search results for the previous period or year-over-year (as soon as the extended data is available), or even a custom date range. Checkboxes let you add Difference and % Change columns to the results as well, giving you all of the information you need for your SEO reports. The connector update is available now from the Analytics Edge license wizard. Don’t have the add-in yet? Download it now! Analytics Edge Add-in Updates: Game Changer!